TR2-The property is located 8.5 miles from Truo and St Austell, a car driver with car essential. There is an hourly bus service to Truo and St Austell both of which have BR stations. 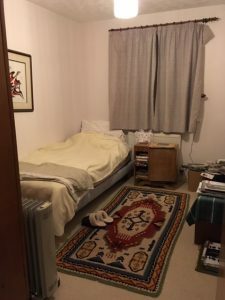 An older, friendly, independent and intelligent person is seeking a Sharer for their home to give them a mix of 15 hours’ help and company each week in exchange for the low-cost accommodation. This person, would benefit from some practical help including help with washing up and laundry, some shopping and cooking, and the general reassurance – for them and their family – of having someone in the home. The accommodation is a single room furnished with a single bed, wardrobe, dressing table and chest of drawers. A shared bathroom with bath and shower head. There is a garden and parking. The property is located 8.5 miles from Truo and St Austell, a car driver with car essential. There is an hourly bus service to Truo and St Austell both of which have BR stations. The ideal Sharer will be a mature, friendly, organised and reliable female, non-smoker, driver with own car, who can give help over a few evenings each week, and a few hours at the weekends. We charge a monthly facilitation fee EACH MONTH INSTEAD OF RENT of £125 + VAT [total £150] for doing this. You may be asked to make a monthly contribution of up to £25 towards bills/council tax [students are exempt from council tax].